push OFFSET HelloWorld ; "Hello, World!\n"
The important thing here is to notice that there is a main procedure and a call to a printf function. So “55 8B EC 68 00 B0 33 01 … ” is the machine code for our C code. How is the shellcode used inside an exploit? Let’s take as an example a simple exploit, a stack based buffer overflow vulnerability. If you are able to successfully exploit this vulnerability you will be able to run your shellcode and you will actually do something useful with the vulnerability, not only crash the program. The shellcode could open a shell, download and execute a file, reboot the computer, enable RDP or any other action. Let’s have a short discussion about each of the above issues. Since we need position independent code, we want to have strings as a part of our code, so must store the string on the stack as you will see in the future parts of this article. In C/C++ it’s easy to call a function. We specify #include <> to use a specific header and call a function by its name. In the background, the compiler and the linker takes care of the problem: they resolve the addresses of functions (for example, MessageBox from user32.dll) and we can easily call these functions by their names. In a shellcode, we cannot do this. We don’t know if the DLL containing our required function is loaded into memory and we don’t know the address of the required function. The DLL, because of the ASLR (Address space layout randomization), will not be loaded every time at the same address. Also, the DLL may be changed with each new Windows update so we cannot rely on a specific offset in the DLL. We must load the DLL into memory and find the required functions directly from the shellcode. Fortunately, the Windows API offers two useful functions: LoadLibrary and GetProcAddress, that we can use to find the addresses of our functions. The NULL bytes have the value 0x00. In C/C++ code a NULL byte is considered the terminator of a string. Because of this, the presence of these bytes in the shellcode might disturb the functionality of the target application and our shellcode might not be correctly copied into memory. Even this situation is not mandatory, there are common cases like buffer overflows where the strcpy() function is used. This function, will copy a string byte by byte and it will stop when it will encounter a NULL byte. So if the shellcode contains a NULL byte, strcpy function will stop at that byte and the shellcode will not be complete and as you can guess, it will not work correctly. The two instructions from the picture above are equivalent as functionality, but as you can see, the first one contains NULL bytes, while the second one does not. Even if NULL bytes are common in compiled code, it is not that difficult to avoid them. Also, there are specific cases when the shellcode must avoid characters, such as \r or \n, or even to use only alpha-numeric characters. It is simpler to write a shellcode for Linux, at least a basic one. This is because on Linux, it is possible to use system calls (system “functions”), such us write, execve or send, very easily with the 0x80 interrupt (take it as a “function call”). You can find a list of syscalls here. This will result in a call to: write(stdout, “Hello, world”, length). On Windows this is more complicated. There are more required steps in order to create a reliable shellcode. This is the first part from a series of articles on how to write a Windows shellcode for beginners. This is the introduction required in order to understand what is a shellcode, which are the limitations and which are the differences between Windows and Linux shellcode. 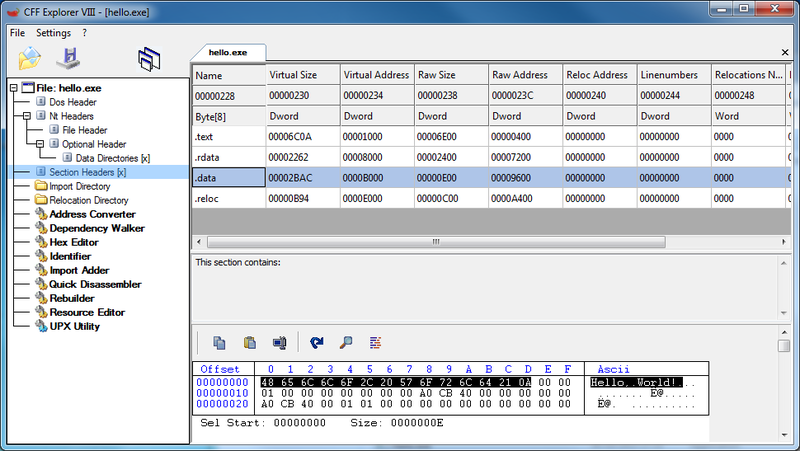 The second part will cover a short introduction into assembly language, the format of the PE (Portable Executable) files and the PEB (Process Environment Block). You will later see how this will help you to write a custom shellcode. Thank you for this. I look forward to the next parts! Do you know of a good Linux shellcode development tutorial? It explains a bit of everything. However, you’ll find a lot of resources on search engines, just search for “Linux shellcode”. If you have any question related to shellcodes,you can ask me here. Thanks! I’m just starting to learn this and would like to begin with Linux.